Ammoniated powerful alkaline buffer cleaner containing an exceptional solvency power on soiled & oily matter which works on all washable surfaces. This specialized product is playing more effective role then Aquatuff. 5, 10, 20, 25, 50 Ltr heavy duty jar for long terms use. Mail us to get discount upto 50% on factory sale offer. All Purpose Cleaner Ammoniated also can be claasified new generation product of Aquatuff, which have more powerful cleaning strength, And due to presence of ammonia molecule its soil dissolving strength increases and even its lower strength can result efficiently on soiled area. Depending on contamination 50 - 200 ml per 10 litrs of water . i. e. 200 mol to a bucket of water. While Aquatuff required ratio is 1 : 10 , which means 1 Ltr Aquatuff and 10 Ltrs water. IMPA: 550163 It is a ammoniated powerful alkaline buffer cleaner containing with an exceptional solvency power on soiled & oily matter . RXSOL-16-1038-210 should be mixed with warm water at a rate of 50-200 ml per 10 litres. i.e. 1 cup of RXSOL-16-1038-210 to a bucket of water.RXSOL-16-1038-210 solution can be applied simply by mops, brushes or rags, or by dipping the soiled articles into the RxRXSOL-15-1501-tech solution. After cleaning, rinse off with cold or warm water. Due to high foaming properties, RXSOL-16-1038-210 is not recommended for washing machines. Tank Cleaning Cargo tank cleaning to remove residues of Mineral, Animal, Vegetable or Fish oil, Waxes & Soot from inert gas systems. 1. Direct injection method for tank washing machines. Dose rate 1-5 litres per ton wash water (0.1-0.5%). 2. Recirculation method. Dose rate 1-7 litres per ton wash water (0.1-0.7%). 3. Spot cleaning. Hand spray neat or diluted on parts and surface to clean and leave for several minutes before rinsing off with clean water. 1.Spray RXSOL-16-1038-210 on with a high pressure cleaning machine and use 1:6 with water.If used with hand sprayer, spray the product neat onto the surface, allowing 1 lit. for every 12 m2. Use a 5-8% solution in a tank washing machine. 2. Leave for about 30-45 minutes. The surface should be kept wet. 4. Repeat the procedure if necessary. • Removes grease, oil, carbon deposits, soil and grime. • Keeps loosened deposits in suspension preventing re-deposition. • Low toxic. • Biodegradable. 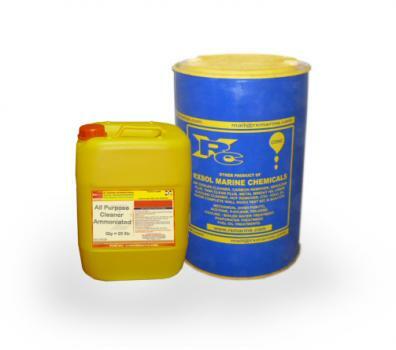 • Free from hydrocarbon solvents. oil, sludge, soot, carbon deposits and general dirt and grime. • Non-corrosive to ferrous metals. • Suitable for all tank-coatings. • Leaves surfaces residue free. RXSOL-16-1038-210 on the dry surface where possible! A dry surface will absorb far better than a wet surface. When applying RXSOL-16-1038-210 on vertical surfaces: Start application from the bottom and work upwards! If beginning from the top and going downwards, the RXSOL-16-1038-210 may produce "channels" down the surface, thereby running too fast off the surface. During high-pressure cleaning: It is important that the rinsing water does not run over non-cleaned surfaces. The rinsing water can draw soap from the surface if running over non-cleaned surfaces. High pressure together with the optimum concentration of RXSOL-16-1038-210 will give the best effect. Step 1: Spraying the RXSOL-16-1038-210 over the area to be cleaned. Step 2: Washing down the area using a high-pressure water jet After the RXSOL-16-1038-210 has been sprayed on the surface. The wash down begins, the chemicals penetrate & thoroughly moistens dirt & other grime. During wash down, the RXSOL-16-1038-210 thoroughly dissolves the particles of dirt, even oil and fat, in the water spray and thus achieves optimal cleaning results. In addition to being more effective, the use of RXSOL-16-1038-210 substantially reduces the time required for the Cleaning operation, as well as preventing dirt from reforming on the surface. The use of RXSOL-16-1038-210 in correct dosages is half the job done. There are currently 0 users and 412 guests online.